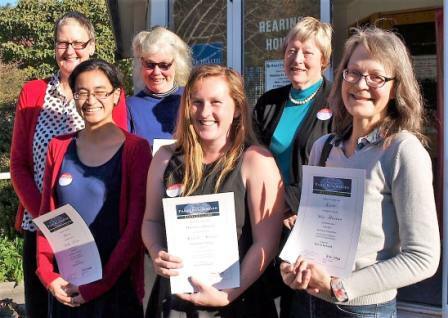 The results were announced by Jo Dippie of Page & Blackmore Booksellers on 13 May 2017 at the AGM of the Top of the South branch of NZ Society of Authors, which was held at the Hearing House, Nelson. The photograph on the right was taken on that occasion. Page & Blackmore has supported yet another fine short story competition organised by the Top of the South Branch of the New Zealand Society of Authors. Sue Perkins and her team have done a great job in carrying it all through. To those writers who made the short list, I offer my congratulations and the happy thought that another judge may have come up with a quite different set of prizewinners. Each of the stories has its own merits; all of them deserve to be here at the end. I changed my mind several times about which stories were ‘possibles’ and which were ‘probables’, though the three stories that most appealed to me stood out as the strongest right from the beginning of the judging process. Finally, let me once again congratulate all on the short list of this competition. It is an honour to be there. And I can only wish that I could have given a First Prize to all three finalists. L-R: Jo Dippie (Page & Blackmore), Feby Idrus (commended), Jackie Cook (second), Reade Moore (third), Sally Astridge (commended), Wix Hutton (commended).